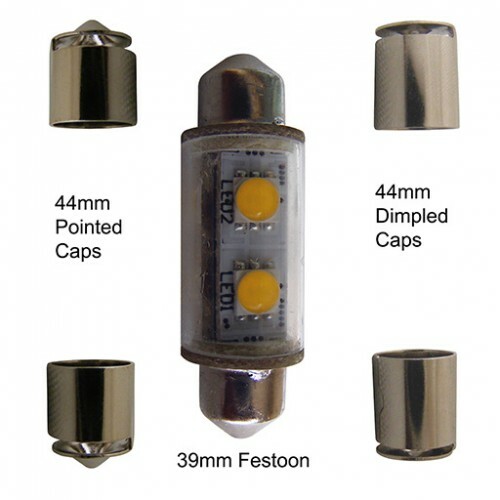 This 24 volt LED bulb is specially designed as a direct replacement for most festoon incandescent navigation light bulbs available on the market such as those from Aqua Signal®, Hella® (3562 series), Lalizas®, Perko®, and several other manufacturers. This high-quality high-power LED bulb is the perfect way to reduce energy consumption on your boat with a current draw of only about 0.1A. They are especially well-suited for mast mounted lights, as their incredible reliability will mean an end to frequent climbs up the mast to replace nav light bulbs. White Festoon Star (PN:8001566) has been replaced by 39-44mm Festoon StarTM PN:9000357 (24 VDC).